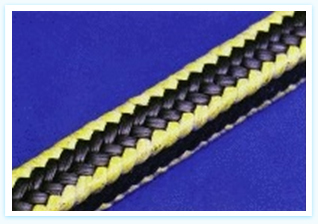 A special quality combination packing incorporated with PTFE Graphite Fibres with additional yellow synthetic fibre reinforcement in the core and corners to give sliding surface and heat dissipation property. It is most suited to centrifugal and reciprocating pumps even at high pressure for abrasive slurries. It can safely be used in hot water, sewage water, oils, gases, liquid ammonia and carbonate solution under high pressure conditions, acids, alkalis, organic and inorganic solvents.